It's interesting, we've had some pretty unseasonably cold weather here the last few days (following some unseasonably WARM weather) and everyone we run into at the Marina keeps going "are you guys okay? Are you warm enough?" But if we weren't, we'd be in a hotel. Seriously, folks,, 80 square feet isn't hard to heat, though you do have to take some things into consideration. First of all, since most boats are poorly insulated, air leaks are an issue. We've crammed discarded foam into every crevice we can find in the evenings to make sure we don't lose the heat we have. The confined space of a V berth, covered over with hard, uninsulated fiberglass, is a formula for condensation. You're in there, you're breathing, and your breath condenses on the ceiling. It's not impossible for it to rain. No foolin. In the original Floating Empire, we had a problem with condensation collecting between the ceiling fabric and the membrane which could suddenly result in a waterfall . . . .of course, directly over the bed. Here aboard Tesla's Rvenge, there's less of a gap in which water might collect, but still the roof above your head can glisten with water. It can get unpleasant. Partly, we solved that with a small, Peltier device dehumidifier that did a great job of removing moisture from the small space (see here). Of course, with the first of the cold winds coming on, we took the gizmo out of storage to discover that it's power supply had shorted out. Ah well. Right now, it's comfy inside, with our new insulation in place, and some candles going, and lots of blankets in the V birth. We'll be snug and fine. Winter aboard a boat is at the same time a problem and rather simple. Insulate the drafts, deal with the condensation, and you'll be fine. Frankly, we're looking forward to it. The problem is: where to put it? 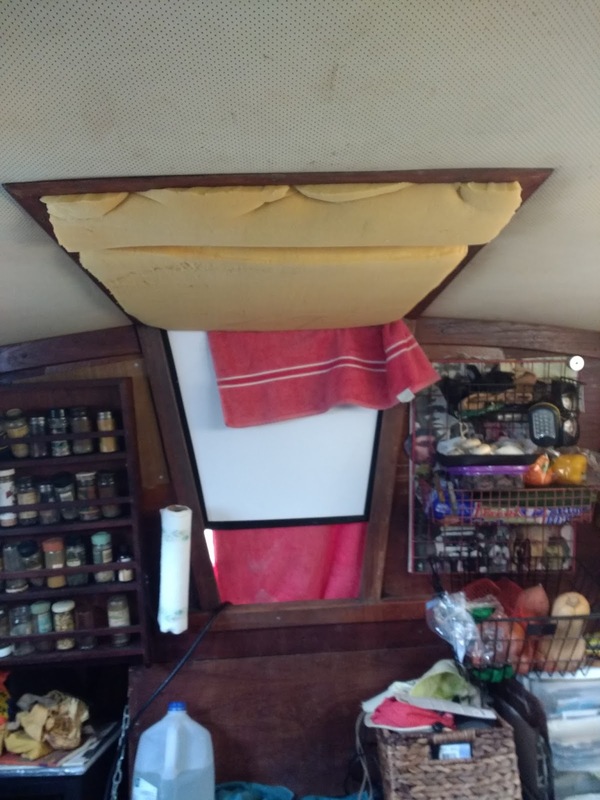 We had pretty good luck on the original Floating Empire with a mylarized bubble wrap called ecofoil, and are thinking of lining the interior of the hull and doghouse with that where ever possible. hello . Ray the van dweller in Pasadena here. I have the same moisture problems as on a boat. only I dont have electric to run a dehumidifier. moister seems to always find a home beneath mattress on bunk. had same problem on my sailboat when I stayed aboard one winter. damp rid helps a lot,but the hanging bag type work miracles. you can watch as the clear part of bag collects water. I keep 2 bags hanging year round & change as needed in my Roadtrek camper van. no more moister collectiing under bed & causing mold. hope this helps out. yes they are available on big "A" . cheers from pasadena. Damprid does work. My only problem with it is that it can get expensive over the course of a winter. Ivation makes a ceramic moisture collector that you plug in occasionally to dry out, which I'm anxious to try. We also find that, even if chilly, letting the air vent out of the boat (along with all the moisture) occasionally really helps as well. The more often you can open up stuff, the better off you are, one thinks. Tomorrow we'll get the flexoglass to enclose the wheelhouse, which will let us impound solar heat while leaving the body of the boat open this winter. Be interested to see how that works out.